Mercury created the Mad Hatter for Lewis Carroll. Now the metal's organic salts in the form of methyl mercury, threaten the great clean up of the Great Lakes. 170 researchers compiling a third of a million measurements have documented in a major BRI (Biodiversity Research Institute) report exactly how mercury pollution affects the region around the Great Lakes. 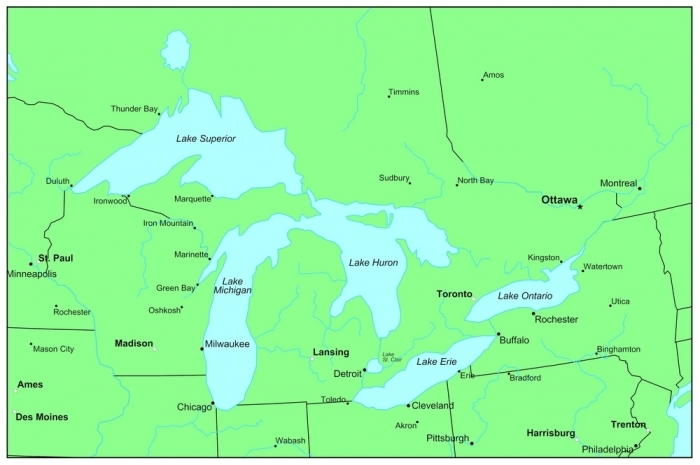 This includes the Canadian state of Ontario and eight US states. While hatters in Carroll's London suffered mental illness from breathing mercury, we usually suffer problems such as cardiovascular disease as a result of ingesting methyl mercury, typically from fish. Burning fossil fuels, waste incineration, metal smelting, chlorine production, mining, and discharges of mercury in wastewater have polluted the Lakes for the last 200 years. Over the last 40 years, authorities have pulled out all the stops to reduce most mercury sources. Charles Driscoll, University Professor of Environmental Systems Engineering at Syracuse University NY, explained, "We documented a 20% decline in sediment mercury deposition from peak values around 1985. This decline was concurrent with a 48 percent decline in mercury emissions from sources in the Great Lakes region and a 17 percent increase in global emissions." Most recently, atmospheric mercury has found its way most successfully into the well-known methyl mercury path in freshwater and contaminated at least six fish species and several aquatic bird species. These six fish had exceeded recommended EPA human limits for mercury concentration in 61% of the region. These were all important game spp. such as trout, walleye, bass (2 spp. ), pike and muskellunge. Ducks such as loons also had alarming increases in mercury content. Common loons offer a useful case study of methyl mercury's ecological effects. Studies on wild loons have established clear relationships between methyl mercury exposure and behavioural and reproductive effects in adult loons. Developing embryos are more sensitive to mercury, especially at lower exposures, than adult loons. In birds, the developing embryo in the egg is the most mercury-sensitive life stage, and effects at this stage are most likely to cause population-level impacts. What we have to consider is how to lower atmospheric pollutions more, in order to address the problem of high mercury concentrations in all freshwater food webs and especially their ecological impact. The reasons for increases have been found to be related to factors affecting these heavily- forested and wetland areas shown in the map below. These northern and especially north-eastern regions have a higher dry deposition (from forest tree leaf-litter) of mercury and have other watershed features that produce more methyl mercury. The fish here, especially in smaller lakes away from the main bodies of water, have higher levels of mercury. Research is ongoing to pinpoint all ecological reasons for mercury ingress and how to stop such concentrations increasing. See the full report. "The good news is that efforts to control mercury pollution have been very beneficial," exclaimed David C. Evers, executive director and chief scientist at Biodiversity Research Institute, and the principal investigator in this Great Lakes study. He and his staff have produced this review document with important summaries and action plans. To combat the recent increases, mercury from coal-fired power plants, gold ore processing, Portland cement manufacturing facilities, and existing sewage sludge incinerators should be particularly restricted. Of the 34 recommended actions by Great Lakes Mercury Emission Reduction Strategy (GLRC 2010) in 2010, these three are held very pertinent to the EPA. Lower Thresholds for Major Mercury Emission Sources; Require Best Available Control Technology for New and Modified Sources; Make Mercury Emissions Reporting Mandatory. Now for the real deal. Can the possible final recovery of such an important body of water act as a beacon for the lamentable state of worldwide wetland and inland seas. Many countries need to look at their mercury, and many other pollutants, and ask if the eco-approach is really for them or simply a way of pleasing groups with special interests. That question is for all of us to consider as we observe the current state of the planet, not simply the greener future that is hoped for.